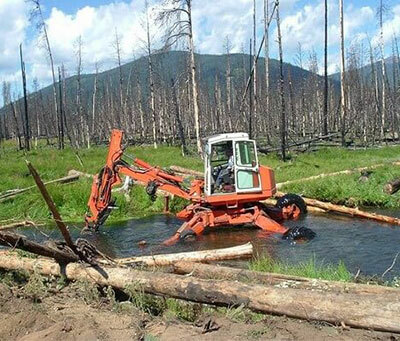 The Spyder Hoe is performing a stream restoration project. The Spyder Hoe is unmatched against conventional tracked machines when performing restoration work. With the machines independently operable, tire mounted legs it is able to operate without disturbing the natural habitat. In addition the Spyder Hoe can operate in up to six feet of water. Making it ideal for stream enhancement projects. Equipped with a boom mounted wench, the Spyder Hoe is able to maneuver logs for placement along streams, while presenting a low ground pressure (3.9 psi). Leaving little evidence that the machine worked in the area. 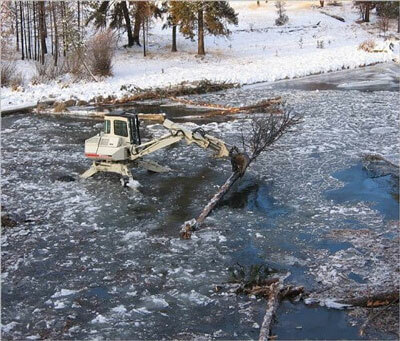 Here the Spyder Hoe improves the in-stream fish habitat by building log structures along Odell Creek in Oregon. Approximately 1.5 miles of the creek were rehabilitated with a marked increase occurring in bull trout numbers the following year.